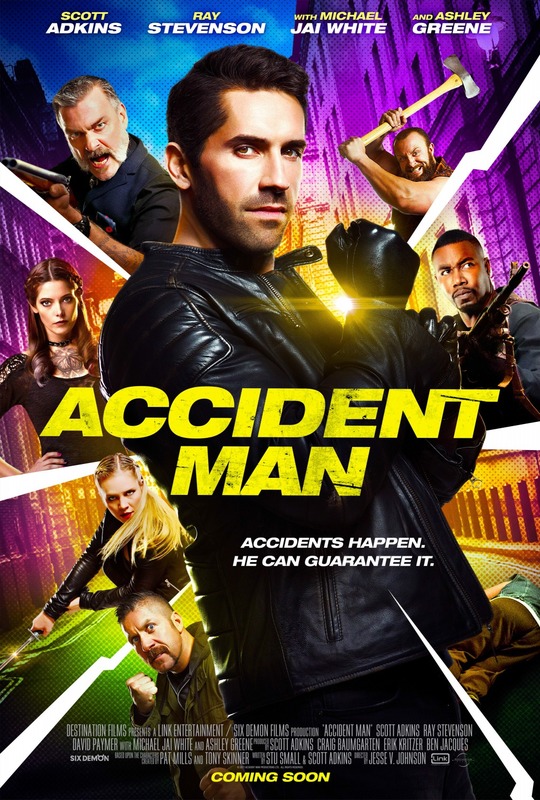 Chrichton's World: Review Accident Man (2018): Decent B action flick but Scott Adkins has done much better! Review Accident Man (2018): Decent B action flick but Scott Adkins has done much better! Accident Man is a passion project from Scott Adkins. And I wished I could say that I understood why that is. Even if it does have some decent elements for the most part it's too ambitious for it's own good. This film is trying to be a gangster flick a la Guy Ritchie mixed with martial arts action. Some say it is very reminiscent of John Wick but I don't agree with that at all. Maybe lore wise but action wise it's less stylish and lacking the choreography to make it look hard hitting. There are too many times when you can tell that Michael Jai White for example is waiting for the punch or kick to happen. It looks fake. Besides the very effective comedic vibe detracts from the seriousness. It rarely feels like there is something at stake. Perhaps with more build up and better characterization I would have bought it more. I really like Scott Adkins and he clearly wanted to do something that stands out from his other films. However he should have come up with a better story and lore building. I dug his narration although I do wonder what the overall effect would have been if this had been done by someone more prominent like Morgan Freeman. Then again maybe they were just following the comics. I wouldn't know since I am not familiar with them. (Did some checking and saw that the narrative is straight from the comics.) Perhaps this adaptation is very faithful to the comics. Still it doesn't change the fact that in essence we are dealing with a character you hardly would root for except for his sudden change of conscience. Normally I am quite optimistic and hopeful. Although when it comes to certain people I am quite cynical and sceptical. Mike Fallon is not the type to change so quickly. They should have shown us how he was with his ex girlfriend. Then perhaps it would have been more believable. Then quite late in the movie we are exposed to a big flashback scene where we get some background on Mike and Big Ray. Tonally it feels like it comes from a different movie entirely. It certainly was one of the highlights of this film. Yet you could have left it out the film and wouldn't have changed anything. Actually having the scene left out might have sped up the narrative and given us a shorter runtime. Because damn does the film takes it time to get to the point. It's pretty obvious what's going to happen once we are introduced to Mike's friends. And it's not like the film gives these friends the meat and depth they deserve. Then what's left? The action. If you are familiar with Adkins then you know what you are going to get. It's decent. However it's lacking the gravity and context to make you invested in the action. Overall it's not bad but unfortunately this is not one of Scott Adkins' best.